Li Anshan is a professor at Peking University’s School of International Studies and director of the university’s Center for African Studies. He has degrees from the graduate school affiliated with the China Academy of Social Sciences and the University of Toronto. An expert on African issues, Li is president of the Chinese Society of African Historical Studies and deputy chairman of the International Scientific Committee of the UNESCO General History of Africa Project. He has published multiple works in China and abroad, including A History of Overseas Chinese in Africa, British Rule and Rural Protest in Ghana, Studies on Nationalism in Africa and Ancient Kingdoms of Africa. 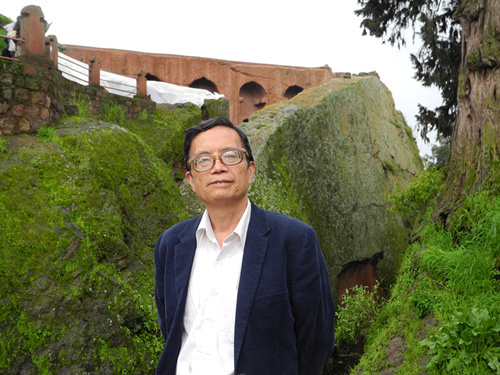 CSST reporters recently interviewed professor Li Anshan at Peking University. The two cups of authentic African coffee immediately brought us into the topics on Africa, and then his experience studying in China and Canada, his academic perspective as well as his assessment of the state of Chinese research on Africa. CSST: In the memoir about your overseas studies, you said that you have always had a reverence for knowledge. Can you describe your education experience? How did you start your academic career with a focus on Africa? Li Anshan: Students my age had different atypical experiences, so we treasured the precious opportunity to go to universities. My father emphasized moral education and knowledge. He was a regular subscriber to Reference News, a daily Chinese newspaper that translates articles of major global news agencies and news journals. This gave me access to breaking news from around the world. I applied for the Department of Philosophy at Sun Yat-sen University as my priority choice in gaokao but ultimately was enrolled at the Department of English at Hunan Normal University. My father suggested that I major in another discipline while using English as a tool. One of the first batch of university students after the Cultural Revolution, I felt sorrow for China’s constant sufferings. In this context, I found it meaningful to investigate nationalism with an initial focus on Africa. My father took me to meet a distant relative, uncle He Guangyue, who was working at the Hunan Academy of Social Sciences. He also encouraged me to start with Africa. At that time, I saved money and bought a massive number of books about African issues in the Changsha Used-book Store. They were translated as part of the Central Committee’s efforts to encourage the public to study world history, including works of renowned historians on African history. I began to explore these books on my own. CSST: You majored in African history at the graduate school affiliated with the Chinese Academy of Social Sciences (CASS). What impact did the experience there have on your academic career? Li Anshan: I had no idea about graduate education at that time, because I only drowned myself in the studies but paid no heed to future achievements. I used my own money to subscribe to the West Asia and Africa magazine, raising the curiosity of my classmates. To my surprise, I was enrolled into the Department of World History at CASS graduate school and became a student of Wu Bingzhen, a research fellow from the Institute of World History at CASS. My enrollment was a testament to the saying that opportunities only favored the prepared mind. One of several Chinese scholars who were familiar with Africa, Wu had devoted herself to reports and studies on international affairs for decades. To intensify my education, she invited about 10 renowned teachers from Peking University, CASS graduate school, Minzu University of China and China Foreign Affairs University to teach me about a host of topics on African history, such as the history of ancient Africa and South Africa, nationalism, European imperialism in Africa, African nations and national independence movements. Such lessons benefited me a lot even though shuttling between different universities was tiring physically. I intended to pursue a doctoral degree in North America after graduating in 1982. Wu introduced me to Chen Hansheng, director of the Institute of World History at CASS and asked him to write me a reference letter. Fellow students of my department helped each other and many of them became experts in China, such as Wu Enyuan and Zheng Yu who specialize in the history of Soviet Union, Tang history scholar Wu Yugui as well as Wang Zhenzhong who is prominent in studies on ancient history. My accumulation of knowledge at the CASS graduate school contributed a lot to my completion of the doctoral curriculum at the University of Toronto. CSST: You have made notable contribution to such fields as China-Africa relations, Chinese migration to Africa, African nationalism as well as African history. Can you talk about your research on these topics? Li Anshan: I was interested in the research history of African history when choosing the topic of my doctoral dissertation, but China and Africa shared similarities in rural issues that deserve close examination. My tutor Professor Martin Klein, former president of the African Studies Association in the United States, also encouraged me to conduct a case study on rural protests in Ghana during the colonial era. I collected information in the national archives of Britain and Ghana, and visited Ghana for field research. After revision, my doctoral dissertation was published in China and the United States. In the thesis, I put forward the conflict between traditional political authorities and indirect rule, which can be demonstrated by the power of the tribal chief. The legitimacy of his power became increasingly suspect as he gained greater trust from the colonial government. His power would be undermined when the colonial government endowed him with more. The tribal chiefs resented colonial officials’ intervention into their power when the chiefs had to ask the officials for help, leading to the contradiction in colonial government between safeguarding traditional political authority and directly sabotaging the authority of the tribal chief. At this point, the system of indirect rule weakened traditional political institutions, but it failed to seek effective substitution. In Studies on Nationalism in Africa, I analyzed forms of nationalism in Africa by exploring various levels of African nationalism and the bonds between nationalism and such groups as farmers, intellectuals and religious leaders. I put forward my perspective based on these studies. Ethnocentrism is a universal phenomenon that all nations consider themselves to be the best. Such sentiment made sense in ancient times when communication was rare, but it can’t be used as an excuse for oppression and exploitation. CSST: Can you talk about your work at the International Scientific Committee of the UNESCO General History of Africa Project? How is it going? Li Anshan: A host of African countries have gained independence since the 1960s. UNESCO decided to gather African scholars to compile a general history of Africa in a relatively objective way in order to overcome the biases of colonialism in the works mostly written by Western scholars. Eight volumes of the General History of Africa were completed in this context. At that time, the chief editors were all African scholars and most participating scholars on the committee were from Africa. Experts from the United States, Soviet Union and other countries also participated in the project. There were no Chinese scholars. UNESCO decided to start the compilation work of the ninth volume of the General History of Africa. I was invited to attend the expert meeting in Addis Ababa, capital of Ethiopia in 2013, and join the International Scientific Committee of the UNESCO General History of Africa Project. I was the only committee member from Asia and became the deputy chairman in Brazil in November 2013. I have been improving my understanding of the extensive and profound African civilization in the recent years, while realizing that Chinese research on African history requires further efforts. CSST: Lately, more and more Chinese scholars in the field of African studies are making their voices heard in global academic meetings or international journals. They have had the opportunity to travel to Africa and carry out field investigations there. At the same time, they exchanged ideas with their counterparts from Africa. What is the current status of Chinese research on Africa in terms of global communication? Li Anshan: Chinese scholars with a focus on Africa have more opportunities to express opinions in global academia. Founded in 1980, the Chinese Society of African Historical Studies under the Institute of World History at CASS has made crucial contributions to the country’s African historical studies, education of talent and development of the discipline. It held multiple academic meetings and proposed a variety of academic topics that sparked intense discussions, playing a crucial role in promoting research on African issues, China-Africa relations and global academic exchanges. A series of research institutes for African studies were set up in domestic universities, cultivating a pool of talent in terms of teaching and studies. The Forum on China-Africa Cooperation provided scholars with a learning platform by establishing the China-Africa Joint Research and Exchange Program while the Forum China-Africa Think Tanks enables scholars to participate in public diplomacy and global communication. The society holds an annual nationwide meeting and its key members are conducting four important projects at the state level about Africa. Universities have promoted exchanges with African academia, and some of them invite African scholars to teach students. Also, government departments and research institutes of foreign countries are inviting more Chinese scholars to participate in projects and forums, and some Chinese works have been translated into English versions. Currently, a batch of middle-age and young scholars are rising. They have affection for Africa and experience with field investigations. Some of them have mastered local languages. With qualified academic capabilities, they are embracing the opportunities for extensive communication with their foreign counterparts.